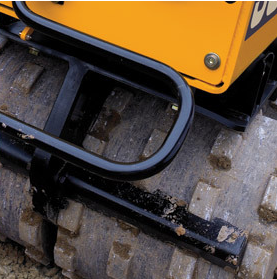 JCB’s multi-purpose soil compaction machines have class-leading performance. 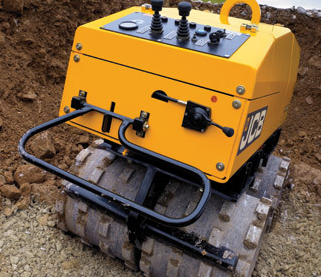 Our machines have superb performance, durability and serviceability to make soil compaction applications simple. 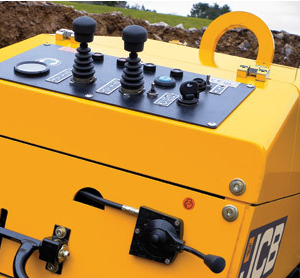 The JCB VM 1500F high-impact ground compactor is just like the VM 1500M except it’s remote controlled. It’s still designed for maximum productivity on a variety of different soils. The VM 1500F trench roller is a class-leading performer and, when you look at the spec, it’s easy to see why. Our compaction rollers feature 4-drum drive steering and a center-mounted vibration exciter system. There’s hydrodynamic braking, a quiet 23hp (16.8kW) 3-cylinder Kubota water-cooled engine, dual scrapers on each drum, an electric start and an engine pre-heater. The VM 1500F trench roller is safe in every way. There’s automatic engine shut down if the machine tips over and a safety control bar to protect the operator. To make sure the VM 1500F trench roller spends as much time as possible working hard, we’ve made it easy to service and transport. An hour meter, hydraulic level sight gauge and indicator lights (for alternator, water temperature and low engine oil) allow you to keep an eye on service requirements. And servicing itself is kept to a minimum on this trench roller by the permanently lubricated, center-mounted vibration exciter system. When servicing does need to be carried out, there’s class-leading access to all components. Finally, the VM 1500F trench roller has a central lifting eye to aid lifting and textile stripes to protect rubber mountings when lifted. The JCB VM 1500M is a manually controlled high-impact ground compactor designed for maximum productivity on a variety of different soils. The VM 1500M trench roller is a class-leading performer and, when you look at the spec, it’s easy to see why. Our compaction rollers feature 4-drum drive steering and a centre-mounted vibration exciter system. There’s hydrodynamic braking, a quiet 22.8hp (16.8kW) 3-cylinder Kubota water-cooled engine, dual scrapers on each drum, an electric start and an engine pre-heater. The VM 1500M trench roller is safe in every way. There’s automatic engine shut down if the machine tips over and a safety control bar to protect the operator. To make sure the VM 1500M trench roller spends as much time as possible working hard, we’ve made it easy to service and transport. Finally, the VM 1500M trench roller has a central lifting eye to aid lifting and textile stripes to protect rubber mountings when lifted.